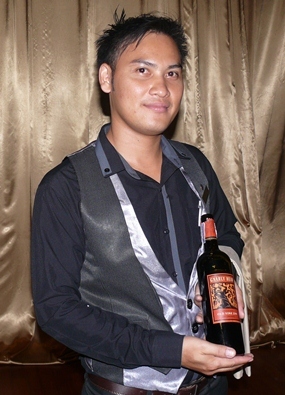 The Delicato Family Vineyards were featured at a wine dinner held at the Sheraton Pattaya. The facilitator was the very affable American Ryan Stewart, who took pride in describing just how the family vineyards evolved from the vision (and nous) of founder Gaspari Delicato, a Sicilian immigrant to California. It was Delicato senior who read the fine print on the Prohibition legislature that exempted home winemakers and religious organizations, so he supplied them with his grapes, transporting them all over the country. When Prohibition was repealed, the Delicato family turned to wine making themselves and in 1935 the first vintage was bottled. Now this is the third generation of the Delicato family, and as anyone who has studied the recent history of Sicily will know, “family” is important! The ever-attentive waiter presents the exceptional Zinfandel. However, everyone also knows that in a wine dinner, this is an opportunity for the chefs to show their talents and how they can match wine and food. And it also an opportunity for the property to show their mettle as well. Sheraton Pattaya has always shone in that regard, and the service staff dressed in the ‘simple black dress’ for the ladies and the men in waistcoats, were quietly attentive at all times. The napery exudes ‘quality’ and the vines above the tables just set the tone for a great evening. Executive chef Spencer Kells (all 6’6″ of him) has always impressed me with his adventurous approach to his cooking, and the guests were not disappointed. 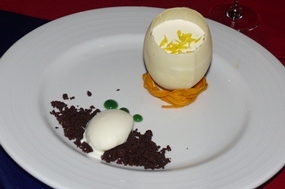 The final dish was award-winning in its concept and delivery. The reception was held in the Latitude bar, giving the guests the opportunity to witness sunset, though it was rather overcast that day. Canapés were consumed with a French Dumont Sparkling Brut NV, and served nicely chilled! 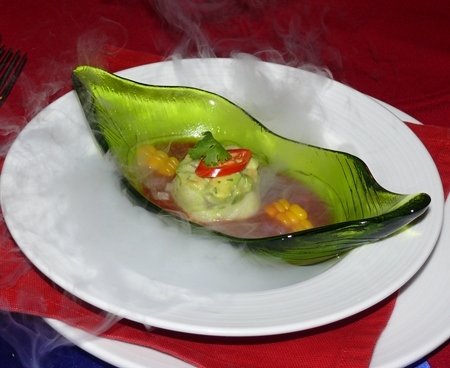 After half an hour of the sparkler, guests adjourned upstairs to the Papaya restaurant and to set the tone for the evening, the Amuse Bouche consisted of scallop and avocado with a tomato ceviche sauce. A wonderful wake-up for the palate! This was followed by the first of the four courses which was a blue crab, truffle mashed potatoes over dry ice and an amazing sea urchin sauce. Spencer Kells indicated that using sea urchin dated back to his ‘classical’ days. 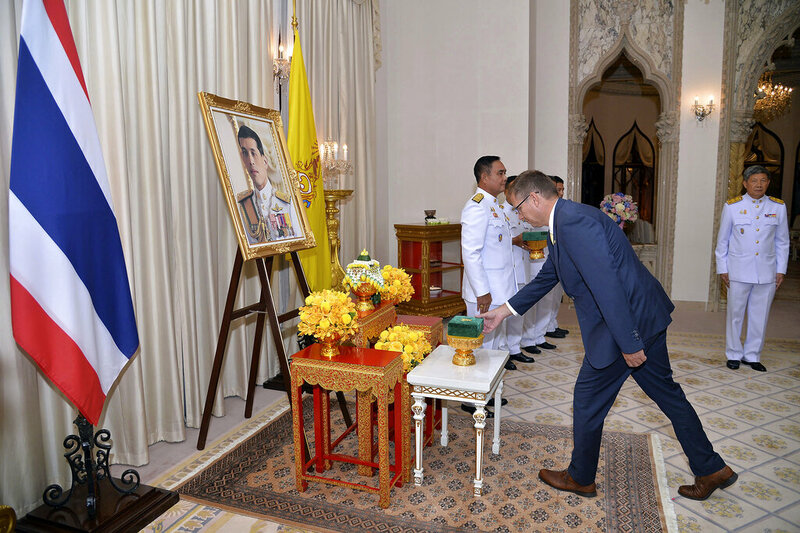 I had never experienced this before, and it was a great start for the more formal part of the dining. This was taken with the Delicato Chardonnay 2011, which came from the Family’s Monterey vineyards. This was a pleasant white with a well-defined nose, easy on the palate, but with a very short finish. An inexpensive wine, it is good for an accompaniment to food, rather than a stand-alone wine for quaffing. The first course was blue crab, truffle mashed potatoes over dry ice and an amazing sea urchin sauce. The second course consisted of braised veal cheek and lobster tail, cauliflower puree, and lobster sauce. I have to say that I was a little disappointed with this dish which was under-seasoned for my taste. It was served with a Delicato Cabernet Sauvignon 2009, again pleasant, without having the ‘wow’ factor of the following wine which was the Gnarly Head Old Vine Zinfandel 2010. This was certainly the wine of the night, and one where you could happily sit on your verandah and enjoy a tipple, just for the sheer pleasure. This was taken with the third course, noisette of lamb, with a cassoulet of summer beans and rosemary. Again this was a dish with subtle flavors, but it melded well with the exceptional Zinfandel. 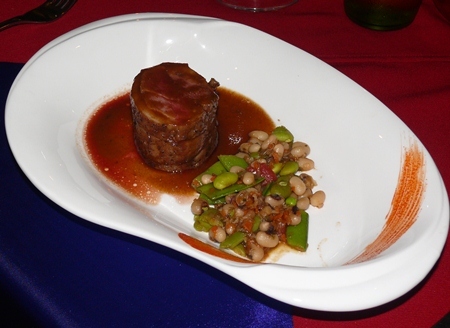 The third course was noisette of lamb with a cassoulet of summer beans and rosemary. The final dish was the award-winner. A coffee panna cotta, mango yolk, white chocolate ice cream. Fashioned to look like an emu egg, you spooned a “yolk” from it. Simply sensational! The wine with this was not a Delicato, but a Quady Electra 2010, a semi-sweet wine with ‘sparkles’ released on the tongue as you savored the long finish. It was another successful wine dinner at the Sheraton and new GM Tomo Kuriyama can now be confident that his team has the depth of talent required to host such events. More please, Tomo!